Step-by-step instruction manual featuring the enameling method of noted glass fuser Peggy Barr. Full of how-to photographs, illustrations and stencil patterns. Covers both wet and dry enameling laminating and slumping glass, kiln firing and annealing. A great overview of wet & dry enamel techniques. Decorate your home with stained glass and fused fountains, oil lamps, trivets, coasters, platters, suncatchers and plant stakes. Lots of flowers, seashells, birds, butterflies, and leaves. Step-by-step instructions are included. Take your love for glass outdoors! Over 20 patterns for garden stakes, flowers, wind chime and bird seed holders. Includes instructions for slumping, fusing and foiling techniques. Jayne brings her fresh and timeless style to the art of Glass Kiln Casting. This inspirational yet thoroughly practical guide presents lush photographs of beautifully finished pieces that will capture the imagination. The clear and simple instructions will enable fusers of any skill level to achieve amazing 3-dimensional creations. Glass Kiln Casting is an 80-page book offering more than 260 color photographs in 12 chapters that will inspire dozens of exceptional projects. The opening chapter features invaluable information covering frit casting molds, tools, equipment and kilns, plus an in-depth yet simple approach to working with digital kiln controllers. This book is sure to become a studio favorite that fusers of all levels will refer to time and again. Jayne's take-you-by-the-hand writing style guides crafters through the frit casting process. She'll show you how to make frit cast jewelry, plates and bowls with amazing results that will impress everyone who views your creations. Take your fusing to the next level. These fresh techniques and projects will stimulate novice to advanced fusers alike. Fuse It gives you a quick review of fusing basics and expands your skills with an array of more advanced kiln forming projects. 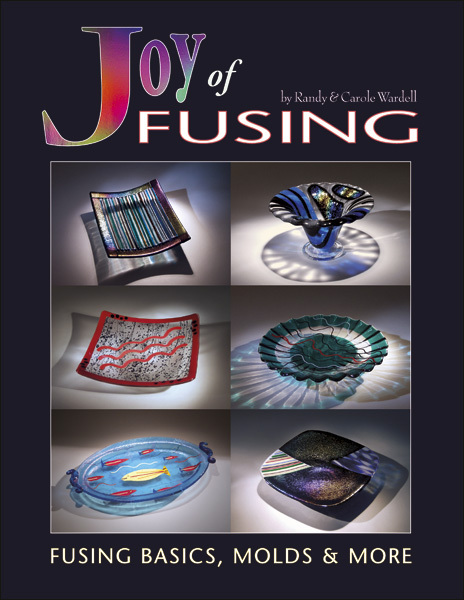 Learn new ways to fuse glass with 18 step-by-step lessons including Wear It (Jewelry), Display It (Holders), Hang It (Mirrors and Ornaments), Drop It (Vases), Zen It (Fountains), Rake It (Hot Combing), Sell It (Marketing your Work) and more. 96 full color pages filed with over 300 color photos. Discover the joy of fusing step-by-step from start to finish. The Joy of Fusing provides every fundamental technique that beginning fusers need, while experienced artists will discover a few new tricks along the way. 27 projects are presented in full color photos with complete instruction and firing schedules demonstrating a range of techniques. The companion publication (Full-Size Project Drawings) makes it easy to create projects as shown and repeat successful firings over and over. 95 pages.